Vienna Strings Extravaganza - Major Discounts on all Vienna Strings! 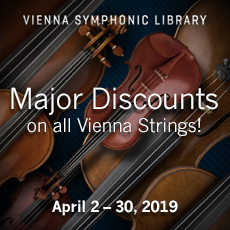 To celebrate all things strings, Vienna Symphonic Library offers major discounts on all other string libraries as well, only in April, 2019. Save up to 30% on this bundle! The big Vienna Instruments DVD Collections are the most powerful sample-based orchestral virtual instruments ever created. The collections, organized in instrument-categories offer the most complete playing techniques and articulations of all instruments, enabling you to create sonic results of the highest caliber and utmost authenticity. This harmonious ensemble of 15 strings (6 violins, 4 violas, 3 cellos and 2 double basses) covers nearly the entire spectrum of string chamber literature. Many composers use the CHAMBER STRINGS for larger orchestrations as well, doubling melody lines to enhance the string sound with more variety and expression. CHAMBER STRINGS I contains all imaginable articulations, including snap pizzicatos, glissandos and artificial harmonics. CHAMBER STRINGS II offers most of the articulations in CHAMBER STRINGS I as muted versions (con sordino). Your purchase of any VSL library entitles you to download the free Vienna Instruments Player software that includes the Vienna Ensemble mixing host. Please notice: To use the "Extended Library" you need to have the corresponding "Standard Library" already registred in your account. "Standard Library" plus "Extended Library" result in a "Full Version"